I’m not too proud to admit, that ordinarily on realising that something has subtitles, I wouldn’t even bother reading a description, let alone be so excited about it that I await its arrival date with poorly concealed glee. But thanks to being persuaded to watch Forbrydelsen (The Killing) by the popular press and some friends and realising just how good it was, when it was announced that the same team was bringing a political drama to BBC4 I pounced on it. I had high hopes. Based on The Killing I was expecting an extremely slick and expensive looking production, a complex storyline elegantly told, and a fascinating bunch of realistic characters that were so well acted it didn’t matter in the slightest they were talking a foreign language. 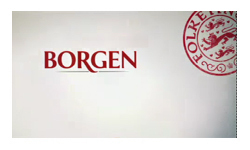 My expectations were high, and yet I was still completely blown away by the first two episodes of Borgen. At the centre of both the show and my positivity is Birgitte, the female leader of the moderate party who is suddenly thrown to the forefront of politics when the major parties unravel. Birgitte is wonderful – she’s passionate about the issues, fed up with negative politics and driven to make things better. She’s also human though, very ambitious but aware that she is somewhat out of her depth. Contrasting her with the rest of the politicians and spin-doctors around her, you can see why the Danish voters would turn to her. The mostly, but not exclusively, male politicians of the major and minor parties are varying degrees of slimy unpleasantness. Only the elder statesmen – her deputy and the leader of a far right party, show the faintest hints of humanity, the younger ones are all mostly pretty hateful. Also milling about is a news team, poking about and making life difficult for all parties. I suspect the question of whether they are friend or foe to the politicians will be one of the key themes of the series, not least because it’s quickly revealed that bright, young news anchor Katrine is having an affair with the existing Prime Minister’s spin doctor… who then drops dead two days before the election. I found this particular storyline and how it played out over the first couple of episodes rather cliché, but even so I have to praise the actress playing Katrine for an amazing performance as she deals with the fall out. So there’s well over a dozen characters and some fairly complex relationships and politics interacting. But Birgitte is a shining light in the middle. She’s charming and funny, driven but insecure, a completely real human being. I want to be her when I grow up. Particularly because in addition to her own talents, she has a wonderful husband and surprisingly nice children. The family relationship is so utterly brilliant I fell in love with them almost immediately. Every scene with them features hilarious bickering and mocking, but with such an underlying warmth and support that I just wanted them to be happy. I really can offer no higher praise for these introductory episodes than to say they reminded me of The West Wing. The series has that similar combination of politics which I don’t have to understand to find interesting, and characters that you can immediately connect with. By the end of the first episode I was so caught up in it that I actually shed a little tear at Birgitte’s success. I’m utterly hooked, and off to spend some time on Wikipedia learning all about Danish politics. The Guardian – Borgen should appeal to everyone to be honest. It’s a fantastically compelling and intricate drama about politics, gender, change and (mainly) power. The Guardian also has a dedicated blog analysing the show. The Huffington Post – Borgen doesn’t stand out with the same stark bleakness as The Killing, but the characters are as well-formed, with enough desires and flaws to keep us happy for another eight episodes, or until the next Danish thriller comes along like a bus. The Telegraph – Similarly to The Killing, Borgen boasted quietly clever characterisation, punchy dialogue and addictive pace. It was as adept at portraying a bitchy TV newsroom or spin doctors’ messy private lives as it was the politics.